Oregon Country is what a huge swath of the Pacific Northwest was called by the USA back in the first half of the 19th century (the British called it Columbia District). For decades the British and the USA disputed where, exactly, the borders should be drawn. The Brits thought maybe it should be somewhere near Northern California, whereas the USA thought perhaps it should be up near the Yukon. But then, on January 5 in 1846 the U.S. House of Representatives passed a resolution calling for an end to sharing the region with Britain. Arguably the US claim was strongest south of the Columbia River, but for various political and economic reasons the push was on to make the 49th parallel the border, which is where the modern day border with Canada is. The Brits weren’t that interested in fighting another war, and the 49th parallel was quite a bit lower than up near the 54th parallel, where some Americans thought the line should be. So they compromised in 1846 with the Oregon Treaty. 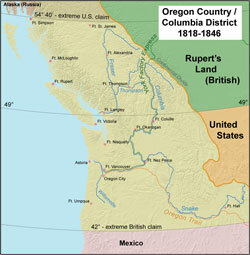 Credit: Oregon Country map by Wikipedia user Kmusser. Used under the Creative Commons Attribution-Share Alike 2.5 Generic license. If I were like Putin, I would return the Oregon Country to its previous glory. Mother Cascadia! Maybe http://www.ifiewerelikeputin.com should be the name and theme of my blog.